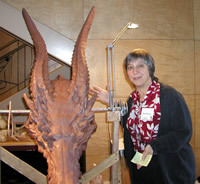 These pictures show Kim Graham's dragon skull sculpture as a work in progress. 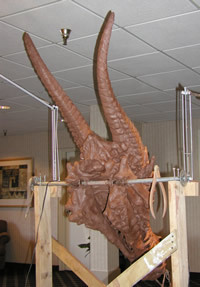 Scaffolding - the skull is built on a wire frame. Kim and Dee hard at work. Time for bed - the clay was wrapped up for the night to keep it moist. 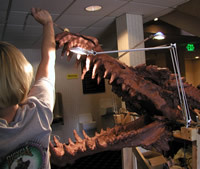 Open wide - Kim checks out the state of the dragon's teeth . "All I want for Christmas" - disaster, the dragon loses its two front teeth. Thankfully this is easily fixed. Back view - Dee spent most of the weekend working really hard on this. Proud owner - Marci will get the first casting (in Plaster of Paris) from the mould.